The most crucial difference between the AC and the DC transmission line is that the AC transmission line uses three conductors for power transmission whereas the DC transmission line requires two conductors. 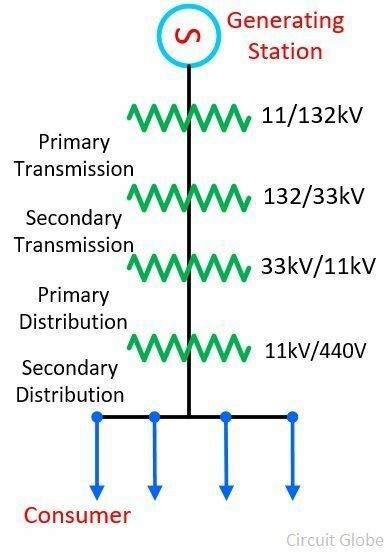 The other differences between the AC and DC transmission lines are explained below in the comparison chart. The transmission line is a closed system through which the power is transfer from generating station to the consumers. The transmission lined are categorised into three categories. Short Transmission Line – The length of the short transmission line is up to 80Km. Medium Transmission Line – The length of the medium transmission line lies between 80km to 200km. Long transmission Line – The length of long transmission line is greater than 150km. The supports conductor, conductor, insulator, cross arms and clamp, fuses and isolating switches, phases plates etc. are the main component of the transmission lines. Definition The ac transmission line transmit the alternating current. The dc transmission line is used for transmitting the direct current. The ac transmission line is used for transmitting the bulk of the power generation end to the consumer end. The power is generated in the generating station. The transmission line transmits the power from generation to the consumer end. The power is transmitted from one end to another with the help of step-up and step down transformer. In DC transmission line, the mercury arc rectifier converts the alternating current into the DC. The DC transmission line transmits the bulk power over long distance. 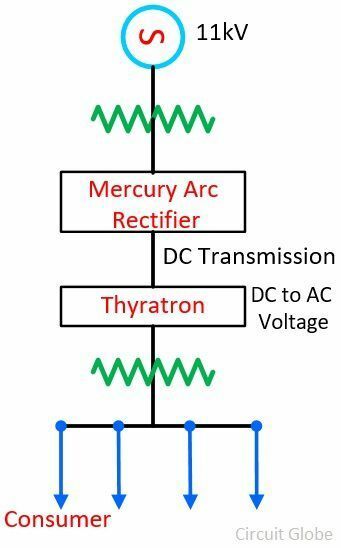 At the consumer ends the thyratron converts the DC into the AC. The AC transmission line transmits the alternating current over a long distance. Whereas, the DC transmission line is used for transmitting the DC over the long distance. The AC transmission line uses three conductors for long power transmission. And the DC transmission line uses two conductors for power transmission. The AC transmission line has inductance and surges whereas the DC transmission line is free from inductance and surges. The inductance and the surges are nothing but the wave of the high voltage which occurs for short duration. The high voltage drop occurs across the AC terminal lines when their end terminals voltage are equal. The DC transmission line is free from inductance, and hence no voltage drop occurs across the line. The phenomenon of the skin effect occurs only in the AC transmission line. The skin effect causes the losses, and this can be reduced by decreasing the cross-section area of the conductor. The phenomenon of skin effect is completely absent in the DC transmission line. At same voltage, the DC transmission line has less stress as compared to the AC transmission line. Hence, DC requires the less insulation as compared to AC. The communication line interference is more in the AC transmission line as compared to the DC transmission line. The corona effect is the phenomenon through which the ionization occurs across the conductor. And this ionisation causes the losses in the conductor. The phenomenon of corona effect occurs only in the ac transmission line and not in the dc transmission line. The dielectric loss occurs in the ac transmission line and not in the DC transmission line. The AC transmission line has the difficulties of synchronisation and stability whereas the DC transmission line is free from stability and synchronisation. The AC transmission line is less expensive as compared to the DC transmission line. The small conductor is used for AC power transmission as compared to the DC transmission. The AC transmission line requires the transformer for step-up and step-down the voltage. Whereas in DC transmission line the booster and chopper are used for step-up and step-down the voltage. The AC transmissions line is used for small power transmission. And for large distance power transmission, the DC transmission system is used.